Moishe Zakharovich Shagalov, better known today as Marc Chagall (1887-1985) was a mixed media artist that excelled in all his favorite fields: stained glass windows, murals, tapestries of biblical themes, and —of course— painting. 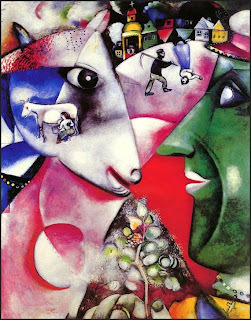 Chagall was born in Vitebsk, then part of the Russian Empire. He was the eldest of nine children in a Hasidic family. After studying art near home, he sought to expand his experience and knowledge of the world, he moved to St. Petersburg first, and later (1911) to Paris. A young man still going through the apprentice stage of his life, he was influenced by fauvism and cubism. His period paintings show a predilection for geometric compositions. While visiting his hometown in 1914, World War I broke out, preventing his return to Paris. In 1915, he married Bella Rosenfeld, who later became his favorite model. After the Russian Revolution, he was appointed commissar of the arts for the region of Vitebsk. In 1923, Chagall moved from Berlin Paris, where he made a living doing illustrations for Nikolai Gogol's Dead Souls, Jean de La Fontaine's Fables, and the Bible. Persecuted by the Nazis, in 1941, Chagall was granted asylum in the United States. I have always been fascinated by Chagall’s painting “I and the Village.” Not that I am partisan of cubist works; in fact I really can never warm up to any cubist painting. Yet, this particular canvas has always touched me in a mysterious way. The painting captures life in Vitebsk, a small village where Chagall grew up. In art, I think we either like something or we don’t. Simple as that. Yet, humans that we are, we can’t help to look for answers, and perhaps find these answers —if there are any— in analysis. Much against my instinct I never tried not to analyze “I and the Village.” So, for years I simply enjoyed the painting. Of late, however, and perhaps due to my advancing in years, I have reflected on the painting and its attraction to me. To begin with, I was born in a small village in Peru. So naturally, the country images: the cow, the few houses, the church, the peasants, agricultural tools, and rural nature, for me, always have held an evocative, nostalgic, hypnotic power. Rather than the loud colors, I have been attracted by the fluffy white and blackness of the sky; not a pitch black sky, for we can glimpse a feeble glimmer of light behind clouds, and even popcorn-like snow studding the starless night. Countless times I’ve placed myself in the midst of the painting, and every time I have inevitably felt a sense of communion with that simple life—away from the mundane din of New York City, where I have lived for the past 50 or so years. I am convinced that my spiritual connection with the painting comes from the disarray of triangles that connect the nature’s basic spheres: flora, fauna, and man. The straight line that depicts the direct eye-to-eye stare between man and cow is the artist’s way of conveying communion, if not downright love of nature. Despite the wintry, frozen wonderland, I cannot help feeling terrific warmth in my heart for this painting. I and the Village is currently on display at the Museum of Modern Art in New York City. Comments on "Marc Chagall (1887-1985) - I and the Village"